Relax and unwind in this beautiful modern craftsman home! The two-story house features one private bedroom with a king size bed, a large loft with a queen size bed and a pull out, plus the downstairs living room sofa, so the home sleeps up to 6 people. The wide open floor plan and fully appointed kitchen allow for great entertaining. A huge wrap around deck provides the perfect place to enjoy your morning coffee, read a book while resting in the hammock or enjoy the incredible sunsets. A wood stove and radiant floor heating make this house a perfect cozy space for winter time getaways as well. Crystal Springs Drive provides a flat stretch perfect for walking, biking or jogging. The beach is a combination of sand, shells and stones and is ideal for strolling or beachcombing. Search for agates or collect shells, sand dollars and driftwood. At low tide, discover star fish and other marine life. Relatively calm waters make this a perfect spot for water activities - rent kayaks or paddleboards! Winslow Way – the island’s “Main Street” - is 15 minutes away. Bainbridge Island is known for its thriving art scene and Winslow Way is dotted with galleries, antique shops and an art museum. Additionally, you will find dozens of local businesses which supply varied and unique shopping and dining opportunities. The home is located on the other side of a small country road from the beach. 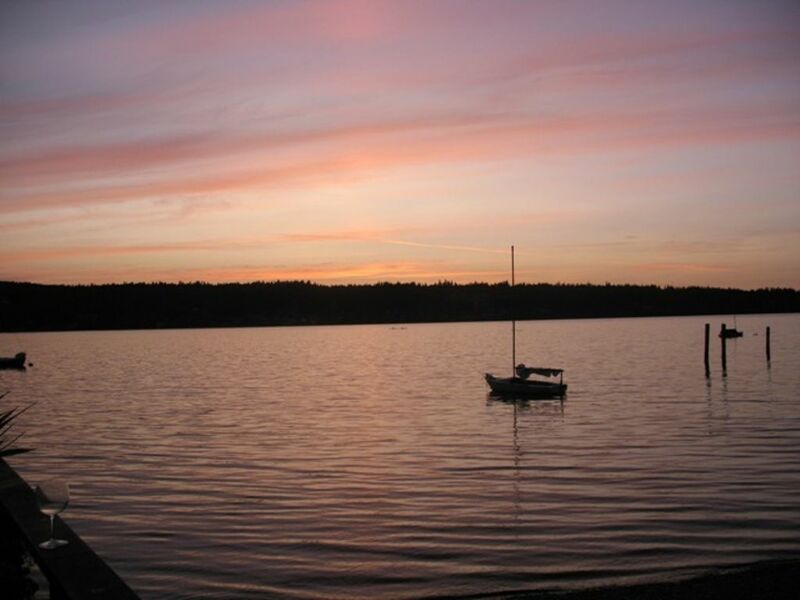 For more information on Bainbridge Island and the rental check out Bainbridge Island Lodging Association. We were very happy with the accommodations! The house was comfortable, well equipped, in a good location, along with nice decorating touches throughout. I gave it a 4 instead of a 5 because the hide-a-bed downstairs was quite uncomfortable for my family member who had to sleep there all weekend. Loved the heated floor on the main level and the shower in the upstairs bath!!! We would definitely stay here again. House and property were lovely and even better than the photos. Agree with other reviews where the steps outside are a bit scary if you do not have good balance as they are rustic but beautiful. Location and access to the beach/waterfront was fantastic! Great visit to Bainbridge for the holidays! Wonderful home with great amenities right on the sound. The home was so cozy, with wonderful decor, great kitchen, comfortable beds, beautiful view of the sound. Eagles, seals and birds galore. Nice cozy place, close to the water, with a great kitchen and fast internet connection. Close to grocery, coffee, etc. Enjoyed and would gladly stay again. Also very close to a lot of trails. My dog loved it! Loved every moment of our time on Crystal Springs and staying at the charming and welcoming beach house! Found everything here that we needed for a most comfortable and peaceful stay. This is a charming cottage on the water. Nice for walking and bilking. Quiet area with fire-pit on the beach. Kitchen is fully equipped. Grocery stores 10 to 15 minutes away. Town & Country and Safeway. Only downside is there are not two separate bedrooms. One master and the other bedroom is right outside the master in the large loft leading upstairs. Great for kids not so for couples. Rates are subject to change without notice. Holiday weeks the high season rate will apply. Reservations in high season of 4 nights or less the higher rate will apply.